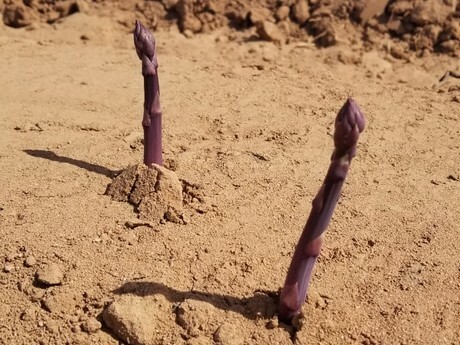 A green asparagus grower with a well-established program that is currently running in the Caborca area has for the first time launched a small purple asparagus trial. Grown adjacent to their existing green asparagus fields, Desert Farms planted the purple asparagus on a 10 hectare field. 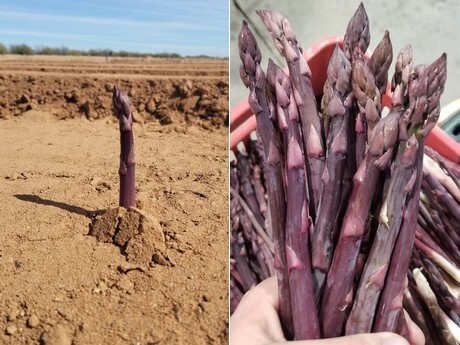 "This is the first season we have planted purple asparagus and it's only a small trial," noted Desert Farms' Bram Hulshoff. "It's a very short season, only going for about five weeks and it also starts about a month after our green asparagus season begins. The short season is due to it being the very first harvest of the crop." The company have faced some challenges relating to the cold weather, which has put harvesting of the purple asparagus on ice for the moment. Hulshoff said warmer weather this week is helping to push it forward again, but it will be a few weeks before they can properly assess how the trial has gone. "We did not have a great start as the cold weather kept pushing the harvest back, and in the end could only harvest a small amount before waiting for warmer weather," he said. "So far, it hasn't been performing as well as we would have liked, but it is activating right now with the warmer temperatures. In three weeks from now, we will have a better view on how the program has gone." Apart from the color, purple and green asparagus are for the most part very similar. In terms of growing methods, there is not a great deal of difference there either, according to Hulshoff. The only major difference is that purple asparagus has a later season compared to the green variant. "The only real differences between purple and green asparagus is that in purple asparagus, the tips are tighter and they come up later," Hulshoff observed. "Otherwise, they are pretty much the same in the way they grow and the conditions they like. Like the green asparagus, they are all hand-harvested and go through the same packing process." In terms of the market, purple asparagus has a limited reach in the US for now. Volume is significantly less than green asparagus and as a result, they are regarded as a specialty item. One sector that does seek them out more actively is the foodservice and restaurant category. "The market is limited and it's a niche item," Hulshoff said. "They attract some good prices but the limited volumes keep a lid on potential. Chefs buy purple asparagus because they are able to create colorful dishes with them. They do have a sweeter taste to them and should only be cooked for a short time, otherwise they turn green." He continued by sharing that Desert Farms sells purple asparagus domestically and also overseas. "For the US market, we pack them in a 5kg box. We also send them to Spain by air freight in flat-pack boxes. Hopefully, from next year we will get more consistent volume which will open up more outlets for us."